The Dancemeditation™ Intensive Training Program is a high quality, committed, in-depth, embodied meditation training within a practicing community for those seeking spiritual and personal transformation and evolution. The 80-day Program completed over four years fully supports development of individual spiritual practice, and invites you into the comfort and dynamism of participation in spiritual community. A Certificate is available at the completion of 80-day Intensive Training. The Intensive Training Program is the pre-requisite for Advanced Training, and the path of Sufi seeking. Are you interested in teaching? Completion of 80-day Intensive Training Program qualifies you for Teaching Certification.Completion and award of a Teaching Certificate qualifies you for Advanced Teaching Certification. Dancemeditation™ Intensive Training is a process of transformative retreat study. 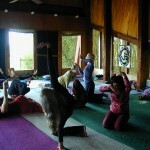 Personal practice between retreats develops and sustains a practitioner’s evolution. The Program inculcates deep listening skills within a multi-dimensional frame; all of you learns to listen, be moved and guided by forces beyond the ego self. Because the process of being receptive catalyzes transformation, healing, and growth, Dancemeditation™ brings continual newness. The 80 days of retreat and Intensive Training is shaped in two Phases. The first half of the Training concerns becoming thoroughly acquainted with the scope of the material—the Tool Kit. The second period concerns the development of spiritual and interior trust. Having a grounding in the Dancemeditation™ process, practitioners move on to existential queries that deep practice inspires. For those interested in teaching, this lineage is less concerned with conveying an elaborate lexicon than with the capacity to shape pedagogical environments from a deeply informed yet Source-guided Self. In Dancemeditation™, a teacher’s authenticity and presence allow spacious scope for the student. Dancemeditation™ is not taught from the head; it bubbles up from body and from the Eternal. The Teacher Training hones trust in this. Through study in a receptive methodology, trainees learn to carry and convey transmitted lineage inside movement process. You may feel that you become more naked over time, that the more you know the less you know, and that you have less and less to tell everyone. Advanced Training embracing Sufi life continues on for those who wish from the completion of the Certificate. This period of training will be initiated by an invitation from Dunya. The classical prescription of 1001 days of dervish training is kept in view as a reminder that spiritual seeking is not quick and finite, but rather a loving surrender. The Dancemeditation™ Intensive Training Certificate, the Advanced Training Certificate and Teaching Certificate are each 80 days of retreat and seminar training as well as Personal Practice Work. The 80 days must be completed in 4 years or less. The annual 2-week Movement Monastery and at the annual 6-day Winter Intensive are required. This training period is non-negotiable. You must attend the full retreat. Being present at the start of the first session and staying through the end of the final session is crucial for your own development and for the safety of the group process. Incomplete attendance voids application of that particular training period to the Certificate. Trainees are required to maintain a regular Personal Practice. The personal practice consists of work with materials learned during Dunya’s Intensive Training seminars or retreats. Which exercises and for how long will be agreed upon at the end of each training period retreat, but expect to do a personal practice 6 days a week, 20′ a day. The specific practices and time frames will be witnessed at the end of each training period to take home as a reminder. Check-ins will be available and scheduled to support trainees in maintaining the development of personal work. Please remember, the Intensive Training is a commitment of time, energy, and money each year for four years. For novices, first year is a grace period during which you will necessarily be considering if this is right for you. (Advanced Trainees make an immediate commitment.) After the first year, however, set your intention and make provisions for the Program completion. Certificates of Completion are awarded all who complete attendance requirements. Teaching Certification is available to those who complete attendance requirements. Meet with Dunya to discuss teaching and request a Teaching Certificate. Advanced Certificates are awarded those who complete the Intensive Training Certificate and the next tier of attendance requirements, and who contribute to the development of the practicing community. What in your background leads you to this study? Why are you interested in Dancemeditation™ Certification Program? What do the words dance and meditation mean to you? Kindly put your name and address at the top of each page. Dunya will review your application and either call or email you with any questions. If you have additional questions, don’t hesitate to ask.